Sanitary napkins are a boon for millions of women in today’s world, but they can also be a nightmare for the environment if not disposed in an eco-friendly way. Since most women do not know how to dispose them in this way, the used sanitary napkins invariably get thrown out with the regular waste where they end up getting mixed with dry, hazardous and wet waste. Such used sanitary napkins can directly affect the health of sanitary workers and pollute the local environment. The effect on the environment can even include contamination of soil and water. According to a study done by WaterAid India in 2018, out of 336 million women experiencing menstruation in India, around 121 million women use sanitary napkins. The study says that this creates around 1 billion sanitary loads per month (because a woman on average uses around 8 sanitary pads per cycle), 12 billion pads and 113 tonnes of menstrual wastes annually. It takes around 500 to 800 years to decompose it. Research says that 28% of this waste is thrown with routine waste, 28% thrown in open and 33% buried . An effective solution to this problem will first have to consider all aspects of Menstruation Hygiene Management. Both men and women should have access to information related to menstruation and menstrual hygiene, menstrual hygiene materials, facilities that provide privacy for changing materials and for washing body with soap (water and soap should also be present at a place of privacy), proper disposal facilities from collection to disposal. At the international, national and state level, there is growing concern about menstruation hygiene management. India’s Solid Waste Management Rules (2016) define menstrual waste as solid waste. These rules also specify responsibilities of the waste generator, local authorities and gram panchayats and producers of sanitary products. As a result of menstrual waste being classified as a solid waste, the biomedical waste management rules don’t apply to it. Biomedical wastes rules related to segregation or disposal are more stringent than the rules applicable to solid waste. This puts many sanitary workers’ health at stake. The Ministry of Drinking Water and Sanitation, Government of India has already prepared Menstrual Hygiene Management National Guidelines in 2015 along with allocation of Information Education and Communication (IEC) funds under Swachh Bharat Mission. These guidelines state that there should be 500 litres of water storage capacity in every school for every 100 children. Unfortunately, these guidelines are rarely implemented at the ground level in villages. In India, sanitary pads are tested as per the standards set by the Bureau of Indian Standards in 1980. These specify tests that are very basic like lumpiness of absorbent filler and softness of the surface of the product and it does not test the toxicity of the ingredients. Further, since sanitary pads are considered as a ‘medical product’, therefore, manufacturers are not required to reveal the ingredients according to the law. And, once the product is tested, people assume that it is safe, which not only poses risks to our health but also to our environment. In contrast, the US Food and Drug Administration rules prescribe biocompatibility (property of a material to be compatible with living tissue) testing of napkins, proper for the length and dimension of contact of a client with the item. The FDA rules additionally express that the supporting specialist knows about dangers, for example, unfriendly tissue response, vaginal damage and harmful stun disorder, related with use of these items and suggests that organizations lead preclinical toxicology and preclinical microbiology tests. Such detailed testing and clarity about the ingredients helps in better selection of materials used, segregation of wastes and safe disposal. The high content of low-density polyethylene (LDPE) plastic polymers and polyacrylate layers used in sanitary napkins gives a sensation of dryness during mensuration. On the flip side, LDPE also absorbs water present in sewage, causing them to bloat and clog drainage systems. This forces conservancy workers to dive down and remove them by hand. [7 It makes the them vulnerable to deadly infections caused by microorganisms present on used pads. Conservancy workers can be vulnerable to diseases like like Hepatitis B &C, E coli, Salmonella, Staphylococcus & HIV  Dioxins used in the sanitary napkins can also cause pelvic inflammatory disease, ovarian cancer, immune system damage, impaired fertility and diabetes. Also, the companies that manufacture sanitary napkins in India usually follow US FDA standards which is based on cool and dry regions and the constituents behave differently in the humid and sweaty environment often found in India. There do exist various disposal methods for sanitary napkins like the use of incinerators and chemical treatment of disposed pads. The problem with the use of incinerators is that they release harmful irritant gases and asphyxiants, leading to dangerous air pollution. The use of chlorine in sanitary napkins also violates the Bio-Medical Waste (Management and Handling) Rules, 1998, which prohibit the incineration of such chlorinated plastics. Construction of girl friendly latrines with chutes for disposal and treatment of the pads is one way of safe segregation and disposal of sanitary napkins. This has been pilot tested in Maharashtra. However, it was not very successful as girls didn’t want to reveal that they’re menstruating. This year, on 8th March—International Women’s Day–the Union Ministry of Chemicals and Fertilizers launched the ‘Suvidha’ biodegradable and eco-friendly sanitary pads at all of its over 4,000 Pradhan Mantri Bhartiya Janaushadhi Pariyojana Stores . It costs just Rs.2.5 per pad and is available at all Janaushadhi Kendras. However, these pads are not reusable, so they are not of much help in in decreasing sanitary napkins waste and also in reducing chances of sanitary workers’ contact with these wastes. To address the issue of waste management with regard to sanitary pads and preventing potentially toxic pollution from their improper disposal, Saafkins was created by Livinguard, a Switzerland-based microbiology and material sciences company that develops technologies to equip textiles and other materials with self-disinfecting properties. Saafkins are new technology sanitary pads which are hygienic, comfortable and reusable. The advertising L&K Saatchi & Saatchi took the responsibility of advertising Saafkins under #GiveHer5 campaign. WOTR and its sister concern, Sampada Trust, took the initiative to promote and motivate women to use Saafkins and started Hygiene for Five days for a month (#Hyfive) project for rural women. These pads, created by Livinguard, cost just Rs. 150 per packet and just one packet is sufficient for a whole year, except for women with heavy blood flow. One Saafkins packet comprises of two sanitary napkins made of a superabsorbent material that can hold up to 100 ml of liquid at one go. A leak-proof lining prevents staining; it is antimicrobial and biodegradable. It also reduces the amount of pads waste generated per woman in a lifetime from over 10,000 to just 80 to 100 pads on average. 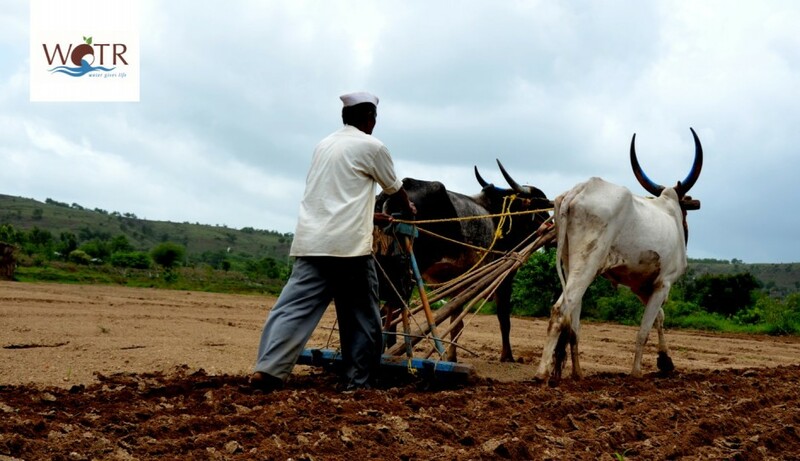 The experience of promoting Saafkins in the villages of Maharashtra, has shown that this solution definitely holds potential in terms of addressing environmental, social and health issues. But for it to reach the masses, there is a need to create awareness among women in both urban and rural areas, to understand the benefits of reusable, eco-friendly pads and the consequences of improper disposal of non-reusable, non-eco-friendly pads. Cooperatives and women SHGs can play a key role with regard to such sensitization programmes and also encourage marketing and sales of these products. This would be an effective way of promoting menstrual hygiene, dealing with health and environmental issues related to menstrual health while creating much-needed employment for women in both rural and urban areas.